We just locked down v2.1 this afternoon, posting it to the iTunes store and awaiting Apple approval (estimated @ 7 days). I think our customers will be delighted with the next release, the main new feature being introduction is Sharing. We thought a lot about what collectors like to do, and why. 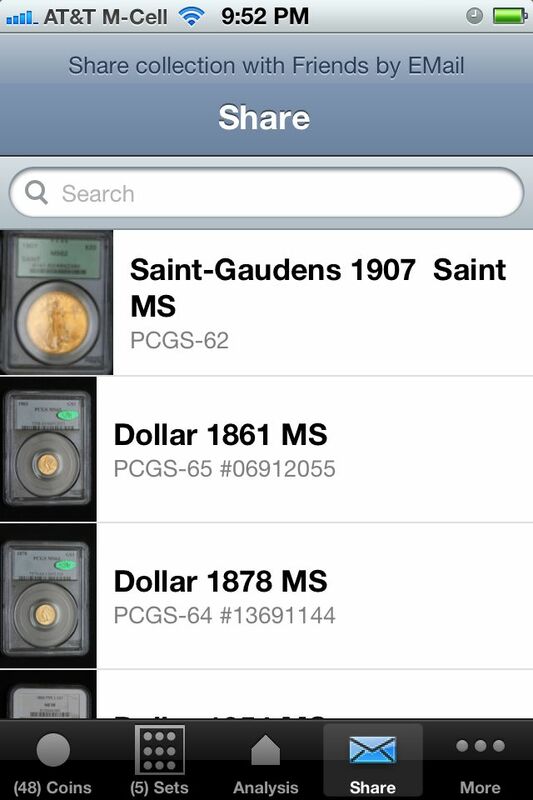 One of the standard features of every coin app is the ability to print reports. That's a given, check-box item on every package. 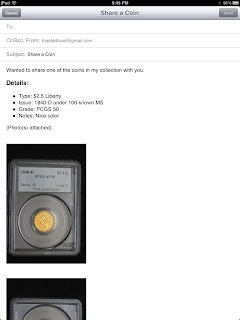 By 'Analysis' we mean things like, what's our investment, what coins are in-the-black, are there any interesting correlations, in the data that might help us be better collectors. We have a basic 'Analysis' feature, which we plan on expanding big-time during the next six months. For now, we have the basics. 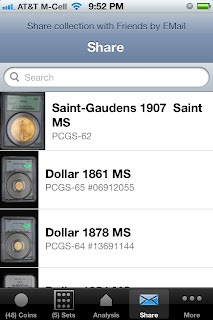 The second item, printing a coin information report which shows the coin details (type, issue, grade, etc.) along with cool photo's of our trophies is an equally important requirement. Thinking on this, we decided hard-copy was just too 80's, that today folks were more into Facebook, Blogging, Texting and EMail when it comes to communication. Our first pass at sharing allows you to email any of your coin's details to, well, anyone.